Summertime means fresh peaches and tomatoes, and easy summertime meals. 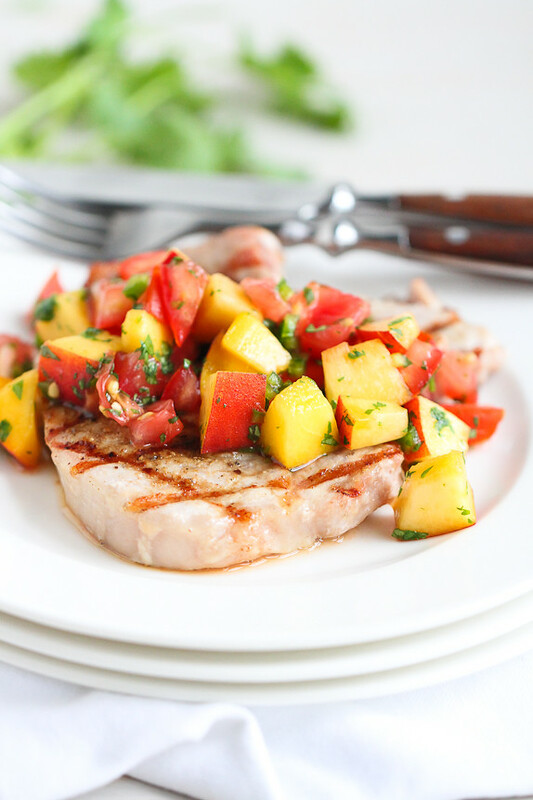 These Grilled Pork Chops with Peach Salsa are ready in less than 30 minutes! Remember when I said that this was the summer of grilled pork chops at our house? 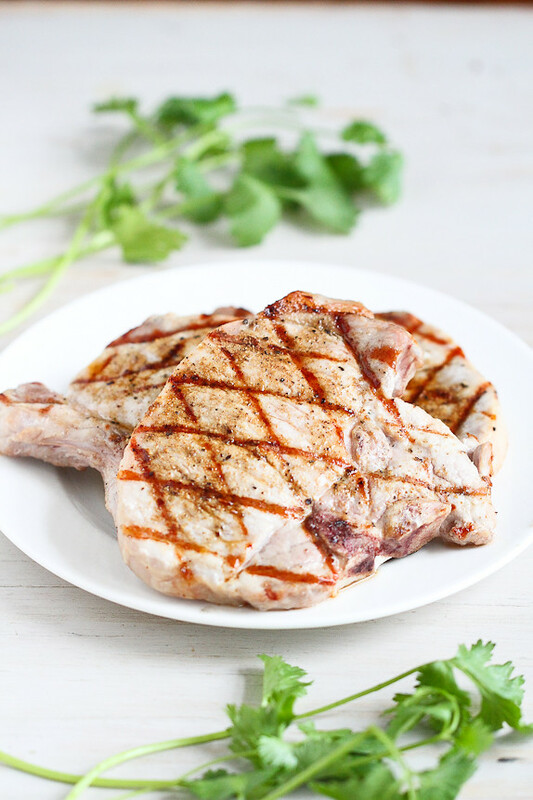 Well, that was back on June 1st when I posted Grilled Pork Chops with Greek Salad Salsa, and do you want to know how many times I’ve made grilled pork chops since then? Exactly two times. Three pork chops meals in one summer does not exactly constitute a “summer of pork chops”. Then again, it’s only the beginning of August, so I still have some time to redeem myself. The porky challenge is on. Between my need to step up to the dinner plate and an urge to do something with the piles of peaches that are rolling through Utah’s markets right now, I figured it was best to try to kill two birds with one stone. Or four pork chops with one peach pit. Or something like that. And then I considered that August is also the month of zucchini and tomatoes. Peach-zucchini salsa seemed out of the question. 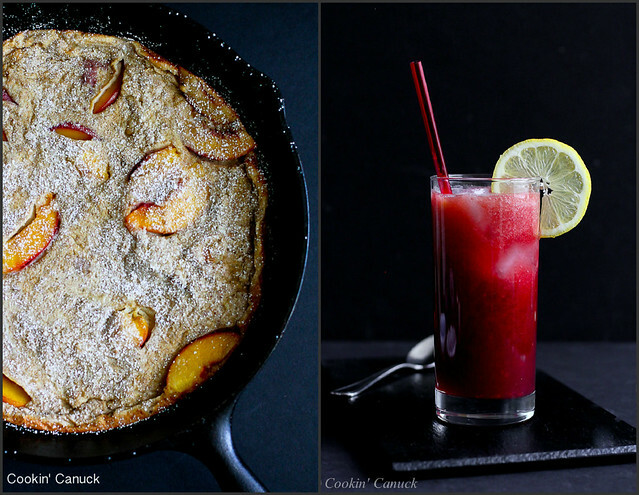 I love zucchini in many forms, but mixing it with peaches made my brain squeal to a halt. But tomatoes are something I could work with – and, after all, they are the queen ingredient of most salsas. The top salsa dog. Compared to the salsa, the pork chop received considerably less consideration. A simple seasoning with salt, pepper and cumin, then on to a quick ride across the grill, to the tune of 2 to 3 minutes per side. I used the thin-cut pork chops because 1) none of us, except my husband, can eat one of those behemoth thick-cut chops I see at the butcher counter and 2) they cook in 6 minutes. Six minutes. That’s seems reason enough to vote for thin-cut! We served this with a Chopped Kale Salad with Grapes & Feta Cheese and some grilled potatoes, but any veggie side dish and healthy carb, little a quinoa salad, will do. Preheat the grill to medium. Lightly coat the grill with oil. In a small bowl, mixture together the cumin, salt and pepper. Rub the mixture over both sides of the pork chops. Place the pork chops on the grill. Cook for 3 minutes on the first side, flip and cook until the pork chops are just cooked through, 2 to 3 minutes. 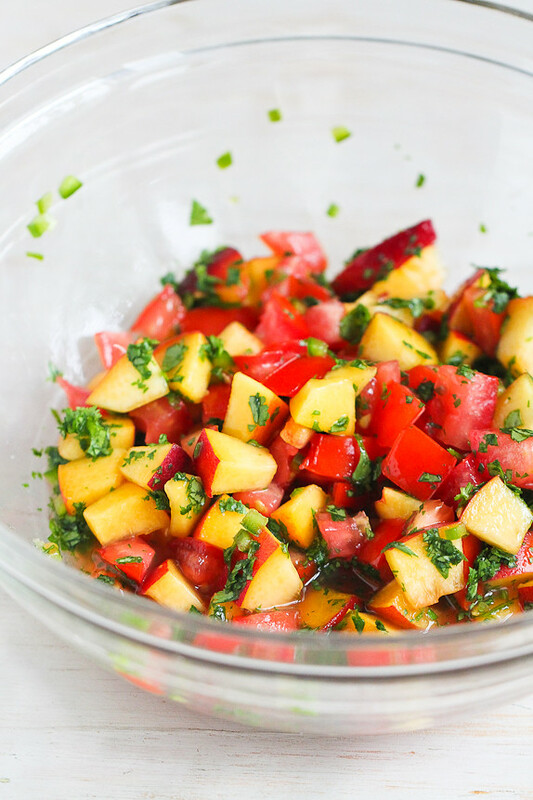 In a medium bowl, stir together the peaches, tomatoes, jalapeno, lime juice, agave nectar, cilantro and salt. I love the freshness of this recipe! I bet the peaches are awesome with pork! You and Brandy (Nutmeg Nanny) are thinking alike with your peach salsa recipes and both quite different too! Love your adding of tomotoes. It not only looks pretty, it looks scrumptious as well! Such a perfect recipe cooking with in-season produce…I know what I’m getting at the farmer’s market this afternoon! That salsa looks amazing and over pork chops – divine! It’s perfect for summer. These looked so good that I went to the store and bought the ingredients. I’m making this for dinner. I’ll let you know how it goes. Gosh you always so enticing with your recipes and the color of your photography. 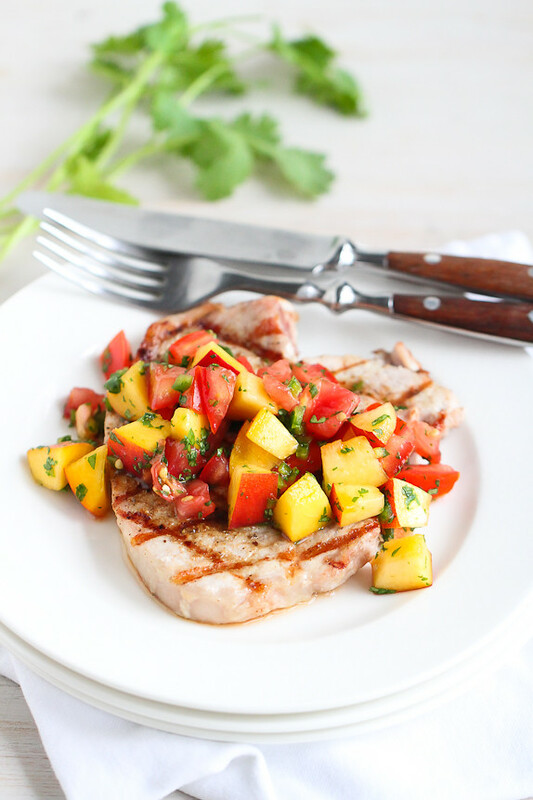 I might pair this peach salsa with grilled chicken tomorrow. Oh my, I want this right now but it’s almost 4 am and probably not appropriate before sleeping. Ha. But I’ll be giving this a whirl as soon as possible. Looks utterly amazing. Oh I agree, always thin cut! This looks amazing and I love that salsa! I love the vibrancy of this salsa! It’s the perfect topping for pork, or just to eat on it’s own. Ben and I are going peach picking this next weekend and just stocked up on pork chops at Costco!! You can COUNT on this mbeing made! Yes! Peach salsa for the win! I love the way it’s pairs so nicely with savory and sweet dishes. I could seriously eat a giant bowl of this salsa….yum! We made this last night and will be making it again. It’s that good! Thanks for a great recipe.